Kuala Lumpur (KL) is the capital and largest city in Malaysia. It's also a melting pot of different cultures that make up the city's character, neighborhoods, and cuisine. Like elsewhere in Southeast Asia, KL is a relatively affordable place to visit. There are many tourists that travel to the area so there is no shortage of hostels and budget guesthouses that you can choose from. Because KL is a such a large and sprawling city, it's important to be near public transportation. There are a variety of neighborhoods that you'll want to exploring while you're in town and many of them are spread out. How much do hostels in Kuala Lumpur cost? BackHome Kuala Lumpur is a favorite hostel in KL. It's centrally located near Petaling St and Chinatown and is near the central market, Merdaka Square, KL Tower, the Islamic Art Museum, and more. The hostel is clean and comfortable with modern furnishings. The staff focuses on the details and you can be assured that they will pay attention to the small things. This is not a party hostel but is the perfect place for guests who want to stay somewhere where there's a social atmosphere but you can also be assured a good nights sleep. Whether you're traveling alone or with a group of friends, this is a good option with a variety of room types to choose from. Private rooms include doubles or three bed rooms. All private rooms use shared bathrooms. Dorms sleep four, six, or eight. There are female only four bed dorms available as well as co-ed rooms in every size. Sunshine Bedz is another top rated hostel in Kuala Lumpur. It's located on the famous Bukit Bintang Walk close to the KL Tower and the Petronas Twin Towers. It's also very close to public transportation. The monorail station is right across the street and there are popular shopping centers in the area. If you want to experience KL's nightlife then the Changkat district with all of its clubs and restaurants, is just a three minute walk away. This is a fun hostel that attracts a young and energetic crowd. If you're traveling alone, or even if you're with a group of friends, it won't be long before you meet other travelers. It's a popular place to stay so there always seems to be people around to chat with. Guests can choose between private and dorm rooms. There are a wide variety of private rooms available including singles, doubles, and four bed rooms. Dorms sleep four or six people and female only, male only, and co-ed rooms are all available. The hostel is family-run and has a modern design that focuses on cleanliness and comfort. The Explorers Guesthouse and Hostel is another popular option in Kuala Lumpur. It's centrally located near many of the city's top tourist attractions. Chinatown, the Central Market, Merdeka Square, Sri Mariamman Temple, and more are just a short walk away. It's also close to public transportation with tram stations close by. The Pasar Seni LRT station is about a five minute walk away. The hostel is designed specifically for backpackers. 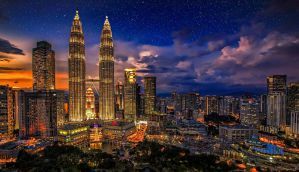 It attracts an international crowd of young travelers and it's a fun place to meet other backpackers that are exploring Malaysia and Southeast Asia. Private rooms are either twins or doubles and each use shared bathrooms. Dorms sleep four, six, or ten people. Rooms are simple but the staff are friendly. This isn't a fancy place, but it's an affordable option that's close to everything you could need in KL. Travellers Palm Lodge is a good budget friendly hostel in the middle of Kuala Lumpur. It's a nice place to relax after a busy day exploring the city. It has a friendly and mellow atmosphere and the staff can help you with recommendations of things you can do in the area. The hostel has a variety of amenities available including a free breakfast every morning, luggage storage, lockers, a laundry service, airport pickup, and more. All of the rooms are air conditioned and dorms come with lockers. Private rooms include twins, doubles, three bed, and four bed rooms. All rooms use shared bathrooms. Dorms sleep up to eight people.